Welcome to Canines 4 Comfort custom apparel center! 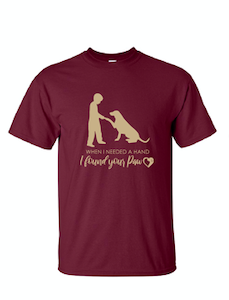 We offer two custom designed t-shirts for a donation of $18.95 ($19.95 for extended sizes). Shipping is included. Limited quantities are available in each size. 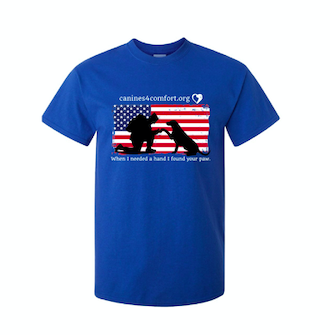 Apparel for Canines 4 Comfort produced by local Veteran-owned company. This is our initial apparel launch. More items may be introduced in the future. If you have suggestions as to what you would like to see offered, please email info@Canines4Comfort.org. Canines 4 Comfort (C4C) was founded by four individuals brought together through personal connections of Psychiatric Service Dogs and Emotional Support Animals.